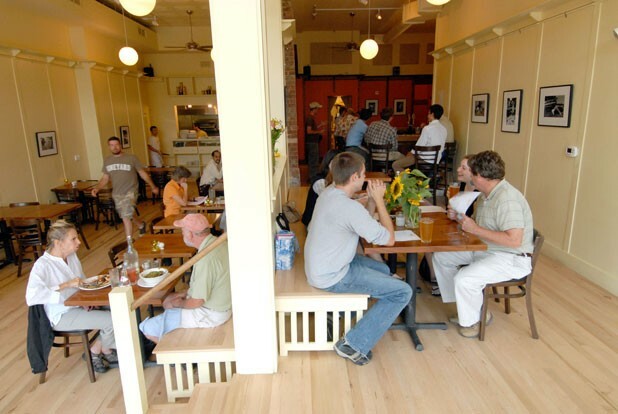 I eat at a lot of Vermont restaurants, and I usually enjoy the experience - which certainly makes my job easier. But until recently, I didn't realize how rarely I have fun eating out - at least not laugh-so-hard-the-Belgian-ale-squirts-out-your-nose fun. That realization came the first time I ate at Claire's Restaurant and Bar in downtown Hardwick. The members of an alternative-type band were cracking jokes and serenading patrons with a guitar and a set of chimes. (Claire's has live music every Thursday.) The crowd - consisting of sun-browned farmers, young families and one dude sporting a mullet - was boisterous in a good way, and the staff appeared to be having a blast. Host and business partner Kristina Michelsen spent her free moments plopped on a banquette at the next table over from us, snagging bites from her friends. At one point, though she had no idea who we were, she struck up a friendly conversation with us. It seemed like the type of place where you might arrive a stranger in town and leave with five new friends. What makes Claire's such a good time? It's a true community center, where everybody knows everybody, and connection is more important than perfection. Not only is the eatery one of the only fine-dining options in the area, but locals financed it: A handful of people pitched in with $5000 loans, and another 50 threw $1000 each into the pot. In return, the latter group got monthly coupons redeemable at the restaurant, which allow them to "eat back" their investments. Perhaps that's why so many of the patrons who lined up at the door that evening, and the next, were obviously committed regulars. In such a down-home atmosphere, it's easier to be forgiving about certain aspects of the service. When it took an extra long time to get our water and Meyer-lemon "Grown Up Sodas" - one of several delicious non-alcoholic options - I figured our genuinely friendly server had probably come across her sister, or perhaps her first-grade teacher, and had some catching up to do. While we were waiting, we entertained ourselves by perusing the super-seasonal menu. Many farm-to-table restaurants opt for lyrical descriptions: Think "grass-fed lamb raised in a clover-studded field at Happy Hooves Farm, braised and served on a bed of hand-plucked baby spinach." Not so Claire's. The "hamburger with roasted potatoes" costs $9. The "bouillabaisse with mussels, clams and scallops" is $19.50. If you want to know where that beef comes from, there's a list of purveyors posted on a board near the door, and on the restaurant's website. Claire's offerings change nightly based on available ingredients: Eaters may notice recurring themes that highlight the best of what's ripe. On one evening's menu, pesto in a variety of guises - arugula, cilantro and presumably basil - appeared in three of eight "small plates" and in a noodle offering. That same day, blueberries showed up in half of the six desserts. Local cheeses are used in abundance. Also notable are the novel ways in which simple ingredients are combined: Walnut bread "bruschetta" is served with arugula pesto, an heirloom tomato is paired with a buckwheat-sprout salad, and a hearty summer pasta dish features nutty whole-wheat fusilli in place of the more refined white stuff. Veggies that are typically shunned at fine restaurants - such as kale, chard and summer squash - make hearty and healthy contributions to the menu. And residents of the Burlington area will be pleasantly surprised by the prices of these local, organic concoctions. Entrées maxed out at $22 - for steak, of course. A vegetarian could easily eat a three-course meal for $25 before tax and tip. Two excellent salads captured the essence of high summer. One paired fresh arugula, golden and red beets, walnuts, blue cheese and crispy lardons of bacon ($8). Just the right portion of maple balsamic vinaigrette, a perfect balance of sweetness and tang, covered the fresh greens and tender roots. Beets also made an appearance alongside crisp green beans, cauliflower florets and peaches topped with hazelnuts and chevre, drizzled with raspberry vinaigrette ($8.50). A flavorful crab cake app ($10) came with a generous squirt of homemade tartar sauce and a refreshing spinach salad topped with earthy sprouted lentils and mung beans. Like several of the other appetizers, this would make an excellent snack to accompany cocktails from the bar. An enticing-sounding pork chop entrée ($16.50) was the glitchiest item we ordered. Although we specifically requested a medium-cooked chop, it came well done and somewhat tough. A side of polenta had a great corn flavor, but was lumpy and needed more salt. Bits of bacon studded the mush, but they were flaccid and flavorless, as if they'd been boiled with the cornmeal rather than crisped in a pan and added later. That treatment was clearly meant to add a savory bacon flavor to the polenta, but I couldn't pick it up. A verdant mound of mixed kale and chard came on the side. The greens were just barely done and chewy - a disappointment to those who prefer them softer, in the Southern style. The apple, plum and berry chutney atop the pork chop, dark purple and sweet-tart, was the best thing on the plate. A sirloin steak with blue cheese and mashed potatoes ($22) - prepared in the rustic, chunky style sometimes referred to as "smashed potatoes" - was tender and toothsome. The small, locally farmed trout, which came with a vegetable ragout, green olives and pistachios ($17), was a hit. The sauce was delicious, and the medley of tender veggies, which included several unusual varieties of cauliflower, made for interesting bites. The fish was served whole, allowing eaters to scoop out the cheeks - considered a delicacy by many - but also forcing them to wrangle with bones. Classy as it looks this way, the fish would be more user-friendly if it were filleted. We sampled two desserts, both bursting with juicy, ripe fruit. The raspberry and blueberry trifle ($6.25), amply slathered with whipped cream, came in a canning jar and was big enough for two to share. We found ourselves bumping spoons as we dived in for the final bites of fruit, cake and cream. The next evening, too full for dessert, we got the peach and blueberry crisp ($6.25) to go, sans vanilla ice cream. It had just as much charm scarfed cold from its to-go container, with the flavor of juicy, ripe peaches complemented by a sweet, crumbly topping. Even when your stomach's full, Claire's is such a sociable place that it can be hard to leave. On that second visit, we ran into some new acquaintances and ended up spending two hours at their table after our own meal was finished, telling stories and sampling food. We snagged a couple of extra chairs, and the waitstaff didn't make a fuss about the transition. I sampled a bite of chicken in fragrant mole sauce and a morsel of praline ice cream sandwich - a community fave. That kind of thing wouldn't happen at any old restaurant, but at Claire's, you can count on it.